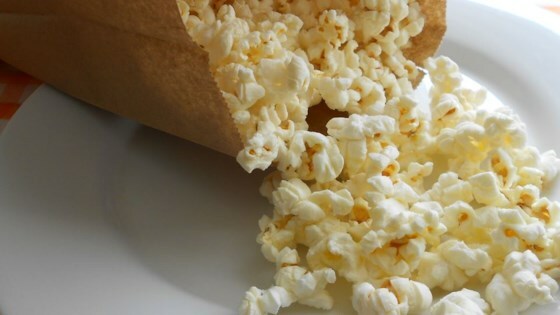 "Believe it or not, you can make your own delicious, low-fat microwave popcorn using standard popping corn and a brown paper lunch bag. It works perfectly." In a cup or small bowl, mix together the unpopped popcorn and oil. Pour the coated corn into a brown paper lunch sack, and sprinkle in the salt. Fold the top of the bag over twice to seal in the ingredients. Cook in the microwave at full power for 2 1/2 to 3 minutes, or until you hear pauses of about 2 seconds between pops. Carefully open the bag to avoid steam, and pour into a serving bowl. Light, airy buttered popcorn starring the aromatic flavors of the Middle East.